We all know that Schnauzers are the most wonderful dogs in the world! Here's your chance to read about some of the antics that our canine companions get up to. It turns out that Schnauzers all around the world are pretty much the same - they make us laugh, they make us cry, sometimes they drive us crazy, they demand our attention and, best of all, they love us unquestioningly - whatever our faults. So, come on, tell us about your Schnauzer - or Schnoodle. We really would love to hear your story. 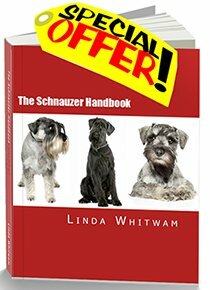 Have A Great Story About your Schnauzer or Schnoodle? Neuter or to not neuter? URGENT! Have you seen Jax - East Sussex? This is my adorable mini, Melanie. NOTE FROM LINDA AND MAX: Not seen a terrier Schnauzer mix before, she certainly looks happy and at home! TO ZACH FROM YOUR MOM AND DAD! Happy Easter to you all.. Linda & Max especially..
Rambo and his friend.. Phantom !! Two Schnauzers are as easy as One...Well how about Three?! Help needed - new schnauzer not eating! IS SHE CUTE ENOUGH ?? Is There a White Schnauzer Breeder in South Australia? Murphy's quiet growling - why? Sgt. Shultz says, "I am NOT a D-O-G!" Schnauzer Crosses are Just Great!